FRONT and centre of any attempt to develop a bonsai is the capture, storage and wise use of energy. Nothing happens without energy, it is the prerequisite for the growth of every living thing and it comes to all plants from the sun via photosynthesis. A tree gets energy from the sun’s rays, absorbing it through the leaves and using some of it to fuel growth. Surplus energy is trapped in carbohydrate molecules (starch) which it stores in the woody parts of the tree. When there is extra demand this starch can be broken down freeing up the stored energy. VERY broadly speaking this is a yearly cycle although extra energy may be needed from time to time including when dealing with an abnormal event e.g. defoliation (more on this later). Trees in the summer, cloaked in energy-gathering leaves, are able to put out many new shoots but also the branches and trunk thicken as a result of storing surplus energy and adding new vascular tissues. In the autumn they become dormant to sit out the winter loaded up with the starch stored during the summer. When spring comes, trees need to put out shoots and leaves. But remember nothing happens without energy and so the stored starch will begin to be broken down to release the energy to fuel growth, and so the new year begins. This cycle goes on year after year for the life of the tree, clearly a tree is a rechargeable battery! progressively thinner and shorter as we move up towards the apex. This will require plenty of fertilizer and water and an oversized pot to provide more consistent moisture levels and soil temperature. When leaves on any particular branch capture energy, starch is stored and new vascular tissue is laid down in that branch and any part of the trunk below that point, resulting in thickening. The more leaves the more thickening. This knowledge can be used to our advantage. The low branches need to be allowed to extend beyond their intended length and develop plenty of foliage to thicken the low parts of the tree. Do not worry too much about refinement other than setting the branch angle as early as possible, the rest of it can be tackled later. Due to hormone influence the apex will always be the most vigorous area and so needs to be repeatedly pruned to prioritise hormone activity in the lower branches encouraging the growth of shoots and leaves. Often the apex is completely removed and regrown from a thinner shoot to enhance taper. By carefully managing the amount of foliage on each branch the comparative rate of thickening can be controlled quite successfully. trunk. This branch will later be removed and so is best grown at the back of the trunk where the scar will not show. It’s worth mentioning that the development of flowers and particularly fruit takes a lot of energy, so at this stage you should cut at least some if not all of them off as early as possible. AS THE tree begins to approach a structural balance with the heavier wood in the lower regions we can start cutting back overlong branches to promote backbudding and so build the structure of each branch. I normally do this type of work around the second half of June but I know others who recommend doing it in the dormant season. By cutting back overlong branches to within their intended length backbudding is stimulated due to hormone activity and the plentiful energy stored in those vigorous branches. Each individual branch can now be treated in a similar way to the development of the whole tree, as outlined in the section ‘The Strategy’, to produce taper in the branch. The techniques for refinement and ramification of the branches depend to a great extent on the species, and vary from tree to tree, so are not covered here, but remember, whatever your approach you will require health and energy in the tree. I HAVE mentioned hormones a couple of times so I think a (very) short explanation is due. Hormones control all aspects of plant development from breaking dormancy to ripening fruit. There are six main groups of hormones, two of which are of particular interest to us. we talk about balancing a tree’s vigour we are talking about cutting off particularly strong shoots with high auxin concentration to allow weaker shoots to extend making the tree bushier. Cytokinins are produced in the root tips and perform a similar function below ground. When we prune roots we encourage smaller side roots to develop thus giving us the same root mass in a smaller space. EVENTUALLY you will feel that your tree is good enough to be exhibited in your local society’s show, a justly proud and exciting moment, but a word of caution. The Tyranny of the Show. You get positive feedback about your bonsai and possibly an opportunity to show it again elsewhere later in the year. You keep it tightly pruned to maintain its appearance for this second show. The following year the same thing happens, and the year after, and all the time you are keeping your bonsai in show condition. The show becomes the priority rather than the health of the tree. The tail is wagging the dog. If you are not careful this constant pruning could mean that there is not enough foliage cover to top up that battery I spoke about and the tree gradually weakens, producing small unhealthy looking leaves and weak shoots in the spring and leaving it vulnerable to pathogens. To avoid this allow some extension growth between shows then prune back as appropriate, or better still, give the tree a year off now and again in an oversized pot, and allow more foliage to bring it back to full strength. IN ANY discussion about stored energy in bonsai it is important to mention defoliation (leaf pruning), the removal of some or all of the outer leaves in mid-summer to promote increased ramification and smaller leaves. This technique is most often used on maples but can be adapted for use on many other deciduous species. In this regard you would do well to seek advice for any particular species. 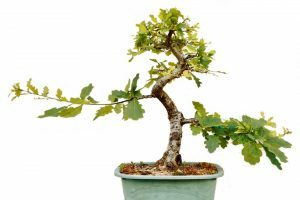 Before using this technique it is essential that you consider the current vigour of your bonsai. It needs to be in tip top condition because a great deal of energy will be called for. When you remove the outer newer leaves you are removing a large source of auxins which would normally migrate down the tree. Cytokinins, produced in the roots migrate up the tree. The reduction in auxins results in an imbalance between these two hormones which triggers buds to activate further back on the branches. The extra light which can now enter the tree with the outer leaves removed allows these new shoots to flourish. Importantly, there is a bud at the base of every leaf and often many other buds further down the tree. These buds do not just replace the missing leaves, each one will potentially produce a whole shoot with several leaves. The ‘battery’, already somewhat depleted after the effort of spring bud break, is now being asked to fuel the growth of many more leaves than before. Is it any wonder that these leaves are smaller! I HOPE that I have helped you to approach your pruning decisions from a different angle. Pruning for the sake of it is bad practice, you need to be able to justify every cut. As I said at the beginning, front and centre of any attempt to develop a bonsai is the capture, storage and wise use of energy. A further note on hormones, if the imbalance is reversed, i.e. reduced cytokinins, roots are formed. That’s how cuttings and air layers work! Clearly some of the above advice does not apply to conifers, particularly with regard to defoliation! However the general principles about energy still apply, even though the techniques and stylistic aims may differ. I acknowledge that I have simplified the amazing complexity of photosynthesis to within an inch of its life, not to mention the wonderful world of hormones, but my skeletal descriptions should be enough to suit the needs of this piece.